The end of the school holidays, 1936, brought a minor crime spree to the lower end of Market Jew Street. Granted, the culprits weren’t exactly the Sabini Gang, who had got away with £21,000 in gold bullion from Croydon aerodrome the previous year - but who can tell where idle pilfering can lead? So: this is how the crime unfolds. Two lads get into Knee’s china shop at number 35, and have a go at the till. Over the road, they break the window at Richard James’ boot-repairing workshop, but only find sevenpence halfpenny [about 3p, equivalent value today less than £1.50]. But next door at number 89, William James’ shop, they strike lucky. They’ve been persistent, and learnt – albeit in an unfortunate context – that determination pays off. When the assistant arrives on Monday morning, he can’t help noticing the unmistakeable signs of two clumsy attempts to gain access: the damage to the roof, the forced entry by the back door. And it doesn’t take long to discover that five shillings [25p, equivalent value today about £10] – all in pennies, which must have been quite a weight - and “six pots of fish paste” have gone missing from the shop. Today, on September 14th, the new school term is underway. The wayward youth of the town are safely back under control, and two apprehended culprits are up in the Juvenile Court. Of course, the lads have fallen out – the court hears – as lads in trouble will unless they are of exceptional mettle. One claims that he only got involved because the other threatened to stab him. But they both plead guilty, and make all the right noises of contrition. The Inspiring entertainment on offer in Penzance for the Fishpaste Gang. The parents tell the court that their sons are keen cinema-goers. These lads like the “pictures”. Perhaps that was why they needed the money, although it hardly explains the fishpaste. The clerk of the court asks which kind of films they favour. “The murder ones”, replies the bolder (or perhaps just the more honest) of the two. Perhaps they are looking back to last year’s The Riverside Murder, or Bela Lugosi in Murder by Television, released back in January. Or perhaps they are looking forward to Murder on the BridlePath (first available in the UK on this very day of their trial). But if they are eagerly anticipating its arrival in town within the next year, they will be disappointed. This is a first offence, so the magistrates say they are not going to be severe. Mr Bennetts expresses the view that “parents should exercise more control over their children, and should take more responsibility in looking after them”. He puts both boys on probation for a year, and each will have to find £1 2s 6d [equivalent value today about £45] to cover the court costs. That’s bad enough: we imagine the boys looking despairingly at their parents, and the parents looking sternly back, all doing mental arithmetic in their heads with varying degrees of success. But Mr Bennetts has more to add. "The boys will not be allowed to go to any films for a period of a year," he says. Would they have considered this an example of leniency? “You must suffer in some way," Mr Bennetts tells the culprits. And the cinema ban will already be taking effect. 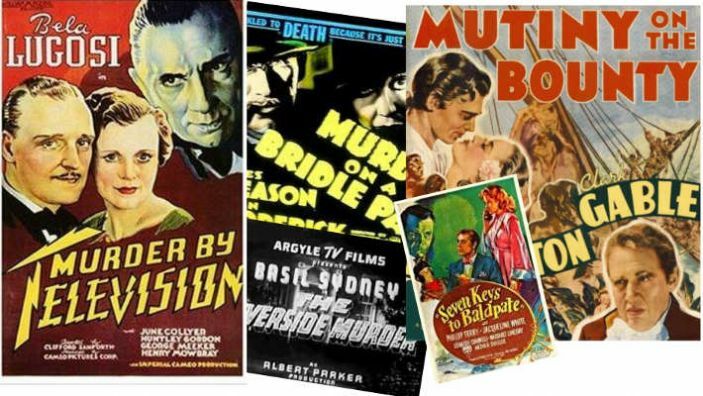 Admittedly, it’s August – with more comedy than murder in prospect – and Jack Bucannan at the Penzance Cinema might not be quite their line. But what about Seven Keys to Baldpate at the Regal? And these days, all the best films are at the new Ritz. The criminal duo may have managed to see The Mutiny On The Bounty with Charles Laughton last week, before the court case. The Dionne Quins this week might not have held much appeal. But the following week? It’s the new Charlie Chaplin. Cornishman Thursday 17th September 1936 – story page 8, Ritz advertisement page 1 (Mutiny on the Bounty advertised page 1, Thursday 10th September 1936. Other cinema advertisements appeared in the Evening Tidings 14th September 1936. The Penzance Cinema is norw the Savoy, and the Regal is on the site of the Penzance 360 bloc (formerly Penlowarth).